Dan Schwarz has been a Professional Reining Trainer and Instructor since 1997. He has multiple reining Champion and Reserve Champion year end titles. He was a Futurity Finalist in the 2001 Intermediate Open and 5th place in the Limited Open Futurity a the All American Quarter Horse Congress. 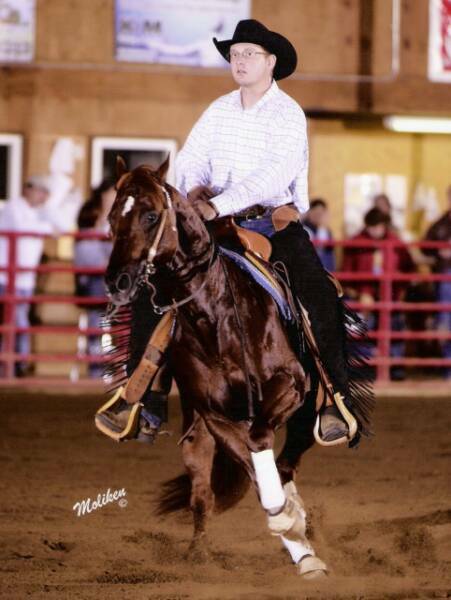 Dan has also competed and won many championships in Category 1 limited, Intermediate, and Open NRHA shows. Dan has trained several Futurity Champion/Reserve Champions, Youth 14-18 Top Ten horses, and Champion/Reserve Champion Non Pro horses. He will work with your horse at any point in their show career start to finish. He has worked with beginner riders and brought them to the top ten in their division and helped polish more advanced riders style and riding ability. Dan specializes in creating a program for each individual catering to their goals and ability. All lessons are one on one. At New Albany Granville Equestrian Center, we offer private one hour lessons in both english and western. Lessons are available Monday - Saturday. Please call for availability and price. We currently only offer lessons on a riders own horse.